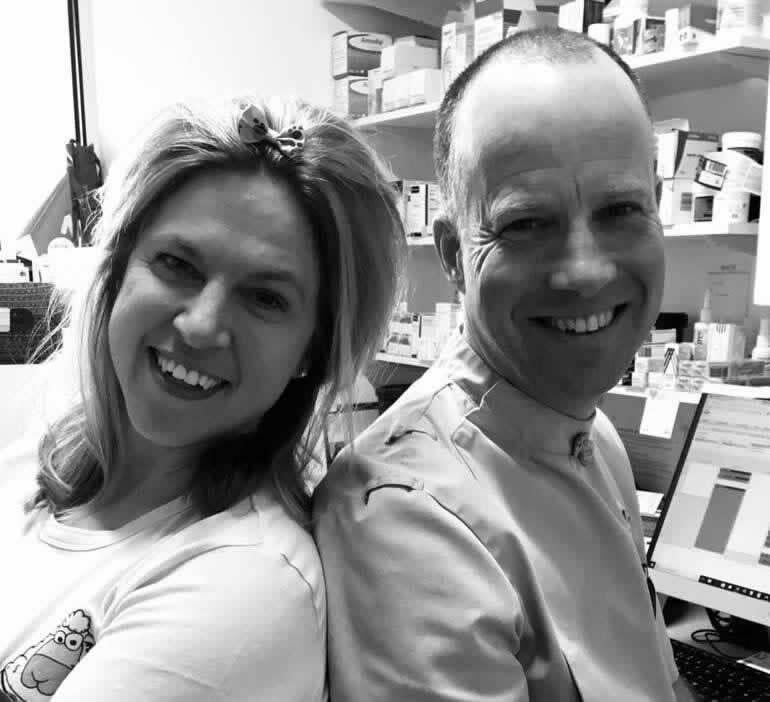 The practice is owned and staffed by Rupert Symes and Lorna Clark. With over 30 years of veterinary experience between them, your pet is in safe hands! I grew up on a farm in Suffolk and trained at Bristol University Vet School. After graduating, I worked at a mixed practice in Staffordshire for 7 years before becoming senior vet at PDSA Nottingham for 12 years. I have three children, two guinea pigs (Bruno and Vincent!) and a dog called Ebba. I have an interest in ear disease and quite like a fracture repair to keep me on my toes! When I’m not at work you’ll probably find me at my allotment. I trained at the Royal Veterinary College, London and after graduating I worked predominantly small animal practice, in both the private and charitable sectors. I live in East Leake with my husband and two children, two Springer Spaniels, a ginger cat and a couple of gerbils. When I’m not at work I love baking and cycling – though not at the same time! I really enjoy integrating the practice with the local community and have loved getting to know our customers and their pets. I would describe myself as very much a general practitioner, though I have a keen interest in dentistry and soft tissue surgery. I graduated from the Royal Veterinary College in 2009. I’ve known Lorna and Rupert for several years and was thrilled when they asked if I’d join the team at Pinfold. I have a Staffordshire Bull Terrier called Henry – he was a rescue dog that need quite major surgery – and I decided to take him on afterwards. He’s now fit and well and Henry and I enjoy plenty of long dog walks when I’m not at work. I have been working as a qualified Veterinary Nurse since 2003. I am the Head Nurse at Pinfold Vets. I have three chickens and two cats. I have worked in both companion animal and mixed practices and was at my last practice for ten years! It’s been really exciting to help set up a brand-new practice. I pride myself on keeping Pinfold running smoothly and looking nice. Out of work I enjoy working on my allotment and keeping fit. I’ve worked as a qualified Veterinary Nurse since 2001, in private practice and for a large charity Veterinary Hospital. I love working with animals, particularly cats, and have five cats of my own. At work they call me the cat whisperer! I live with my husband and have two grown up sons. I love crafts and baking and spend most of my spare time doing one or the other! I have been working in mixed, small animal, and referral practices as a Veterinary Nurse for MANY years, but decided to formalise my qualification in 2013! I joined Pinfold Vets when I moved from Kent to Kingston-on-Soar and am still enjoying exploring this lovely area. I consider myself to be very lucky to be employed in a job which allows me to meet lovely animals and their equally great owners. I enjoy swimming, cycling and (trying) to grow vegetables! I work part-time for Pinfold Vets as an Animal Care Assistant. I have an NVQ Level 2 in Animal Care and previously worked in a boarding kennels. I have two dogs and a horse and I am hoping to continue my education and gain experience at Pinfold Vets to further my career working with animals. I work on Reception here at Pinfold Vets. I have worked in Customer Service for 8 years. I never thought I would be lucky enough to work with animals…until now! I love animals and am really enjoying learning as much as I can. I have a dog called Rupert, tropical fish, two snakes and two Giant African Land Snails. I’ve been with Pinfold since it opened in 2015 – it’s been really exciting to be a part of a new business venture and seeing our customer base grow! I live in the village so you may see me walking Rupert, feel free to come and say Hello! I look forward to seeing you and your pets. I’m Alison and I joined the Pinfold team in July 2016. I have a grown up daughter, but no pets – yet! Though I’m not sure how long that will last now that I work at Pinfold! I enjoy the busy days at Pinfold and helping people who need our services. I live locally – so you might spot me in the Co-op, or maybe even the Round Robin! I’m Dawn and I’m a Receptionist at Pinfold Vets. I started working here in November 2017. I previously worked in accounts and for a bank, so working at a Vets was a totally new experience for me. But I love animals and have several pets of my own, and customer service is important to me – so I love being part of the Pinfold team.